If someone asked you what is the difference between a Methodist and a televangelist or some other form of denominational expression, what would you answer? 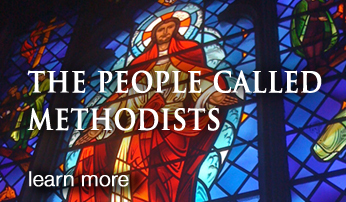 In a nutshell, Methodists affirm an experienced, scriptural, practical, disciplined, connectional, ecumenical Christianity. To understand the unique emphases of the people called Methodist, we must have an insight into the life of a man called John Wesley. One of 19 children, John was born to Samuel (a devout Anglican priest) and Susannah Wesley in 1703. Susannah reared her children in a well-disciplined spirit. The children learned their alphabet in one day and all nine of the children who survived learned to read before they were 6 years of age. Susannah spent one hour a week alone with each child in prayer and spiritual counsel. At age 6, John was saved from a burning parsonage by neighbors who made a human ladder for his rescue. From then on he referred to himself as a “brand plucked from the burning” (Zechariah 3:2). He believed he was saved for a purpose. At 17, John studied at Oxford University to be trained as an Anglican priest. While there he organized the “Holy Club” – a group of students dedicated to spending all their time doing the will of God. They visited the sick and people in prison, spending many hours in prayer. After his schooling, John and his brother, Charles, came to Georgia to work under Governor Oglethorpe, ostensibly to convert Indians to Christianity. He was also exposed to slavery during this time. When he arrived, a Moravian minister asked him “Do you know Jesus Christ?” Wesley replied “I know he is the Savior of the world.” “Yes, but do you know he is your savior?” John answered with a faint “yes”. He was uncertain. After two years of failure in attempting to convert the Indians, he returned to England, despondent and discouraged. On the return ocean voyage, he faced a terrible storm at sea. While he was scared to death and shaking in his boots, a group of Moravians calmly sang hymns and trusted in God’s care. No longer was Wesley a man who gave to God; he was a man who received from God. He was no longer a servant, primarily; he was a son – God had adopted him. His brother, Charles, a few days earlier, had also come to trust in Christ alone. From his experience came such hymns as “O For A Thousand Tongues To Sing”, “Hark, The Herald Angels Sing”, “Where Shall My Wandering Soul Begin”, and “Long My Imprisoned Spirit Lay.” From then on, Wesley preached two themes: Christ dying for us and Christ reigning in us. He said to all he met, "If your heart is as my heart, give me your hand." Wesley wanted to regenerate the Church of England but it closed his doors to him. He organized Methodist Societies that were open to all who desired salvation. When the societies came to America, the Anglican Church would not ordain priests for the new continent. Wesley was forced to ordain priests so that the thousands of Methodists in the colonies might have touch with the sacraments. The Methodist Societies became a church in the colonies. They differed from their mother church in that they used lay preachers and extemporary prayer. John Wesley answers: "A Methodist is one who has the love of God shed abroad in his heart by the Holy Spirit given to him. One who loves the Lord with all his heart and soul and mind and strength. He rejoices evermore, prays without ceasing, and in everything gives thanks. His heart is full of love for all mankind and is purified from envy, wrath, malice, and every unkind affection. His one desire and the one design of his life is not to do his own will, but the will of Him who sent him. He keeps all God’s commandments from the least to the greatest. He follows not the customs of the world, for vice does not lose its nature by becoming fashionable. He fares not sumptuously every day. He cannot lay up treasures upon earth, nor can he adorn himself with gold and costly apparel. He cannot join in any diversion that has the tendency to evil. He can no more speak evil of his neighbor than he can lie. He cannot utter unkind or evil words. He does good unto all men, unto neighbors, strangers, friends, and enemies." These are the principles and practices of our church. These are the marks of a true Methodist. By these alone do Methodists desire to be distinguished from all other men and women. 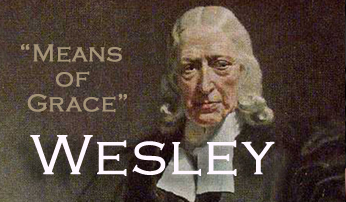 John Wesley died in 1791 having preached the free, redeeming grace of God for all humankind for 53 years. His final words were “Best of all, God is with us.” In these last words of Wesley we find another distinguishing mark of the people called Methodist. Wesley believed that salvation was for all and that it can come in this life at the present time. Methodists believe that new, abundant life is available right now to every person. ​​​​​​"In the evening I went very unwillingly to a society in Aldersgate street where one was reading Luther’s Preface To The Epistle to The Romans. About a quarter before nine, while he was describing the changes God works in the heart through faith in Christ, I felt my heart strangely warmed. I felt I did trust in Christ, Christ alone for my salvation; an assurance was given me that he had taken away my sins, even mine, and saved me from the law of sin and death." is open to the public daily between Memorial Day and Columbus Day weekends. Please come and visit. 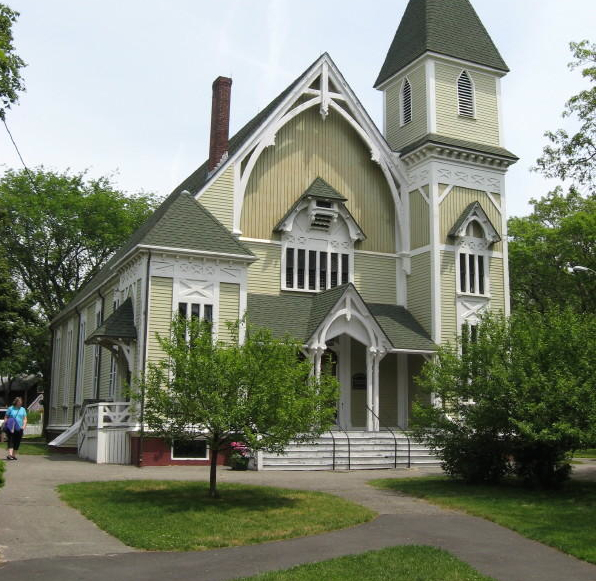 of the Martha's Vineyard Camp Meeting Association, which became a national historic landmark in 2005. 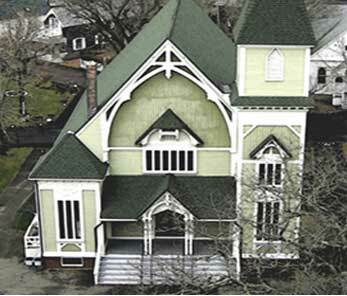 The Old Whaling Church in Edgartown, Christ ("Stone") Church in Vineyard Haven, and Trinity in Oak Bluffs. Today, our church provides hospitality year-round to many non-profit groups serving various needs on the island. backgrounds come together to listen and discuss interesting topics), and occasional weddings and funerals. of Bishop Sudarshana Devadhar and District Superintendent Rev. Dr. Andrew Foster III. 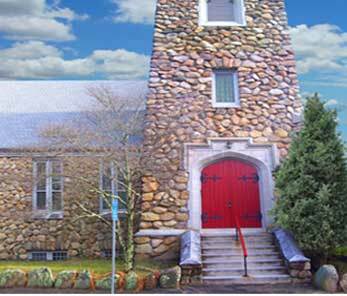 To travel from the Steamship Authority terminal in Vineyard Haven to Trinity Church and the Parish House in Oak Bluffs, click here for directions. 1. Spiritual Life – We are a people who yearn for God and seek healing and spiritual life through Jesus Christ in order to be united in trust and mission. 2. Vital Faith Communities – As a people who yearn for God, we recognize that others yearn with us, and we will reach new people with the Gospel of Christ. 3. Diversity and Inclusivity – As a people who yearn for God, we recognize that racism and all forms of discrimination undermine our ability to further the ministry of Christ. 4. Leadership Development and Accountability – As a people who yearn for God, we will equip our churches, clergy, and laity for unabashed pursuit of effective ministry. 5. Stewardship – As a people who yearn for God, we will be connected and accountable to God and to each other in the ways all our resources support the shared ministries of our congregations, our conference in New England, and Church throughout the world.